Donald Trump's Tax Records: Were His Financial Moves In 1990s 'Genius' Or 'Colossal Failure'? The 1990-91 recession was catastrophic for Donald Trump's empire. A tax document published by The New York Times shows as late as 1995, he was reporting an annual loss of $916 million. What happened? 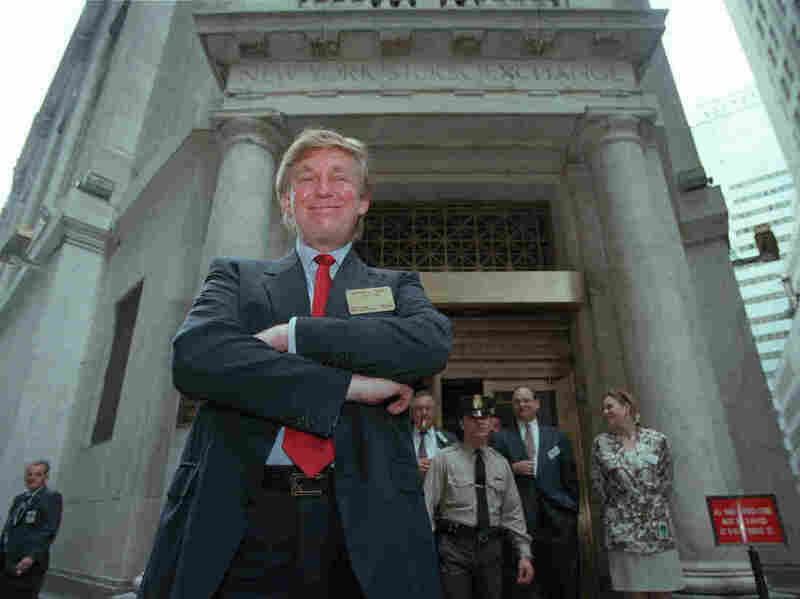 Trump's Financial Moves In The '90s: 'Genius' Or 'Colossal Failure'? Donald Trump poses for photos outside the New York Stock Exchange in June 1995. Most Americans remember the 1990s as a prosperous time when companies were expanding, wages rising and stock prices soaring. In 1997, Fortune magazine published a story headlined: "These Are The Good Old Days ... The U.S. Economy Is Stronger Than It's Ever Been Before." "I was walking down Fifth Avenue with Marla Maples in 1991. This was at the peak of the bad market. Across the street I saw a man in front of Tiffany with a tin cup. I looked at Marla and said, 'You know, right now that man is worth $900 million more than I am.' "
His financial failures were widely noted at the time. In 1990, Newsweek described Trump as "tarnished by marital scandal, mired in debt and negotiating with banks" to salvage his business. It said he was buried under a "hefty $3.2 billion debt." The New York Post mocked him with the headline: "UH-OWE!" Just how long Trump's troubles lasted is not clear. But late Saturday, The New York Times published tax records showing that as late as 1995, when the U.S. economy was growing again, Trump was still in deep financial trouble, declaring a $916 million loss. Given what he told Esquire about being so broke in 1991, Trump's 1995 setback may have been only part of a series of spectacular losses stretching over several years. Why did things go so wrong for the man who appeared so successful in the 1980s, when he was buying himself extravagant gifts like a yacht and helicopter? In the mid-1970s, New York City's fiscal crisis made commercial real estate much cheaper in Manhattan. With money borrowed from his father, Trump began his career as a developer. As the New York economy rebounded in the 1980s, Trump's fortune grew. When legalized gambling expanded in Atlantic City in the mid-1980s, Trump borrowed more money to enter the casino business there. Through a series of transactions, he ended up taking over a half-finished megaproject called the Taj Mahal Casino in Atlantic City in 1988. By the decade's end, his holdings included three casinos, an array of properties and the Trump Shuttle, an airline offering hourly flights connecting New York to Boston and Washington. When the recession hit in 1990, Trump's empire could not keep pace with the enormous debt payments he owed. The airline never turned a profit and had to default on its loans. "By the spring of 1990 I was deeply in the red; my empire was hemorrhaging value," he later wrote in his book The Art of the Comeback. In 1991, the Taj Mahal filed for bankruptcy, and in 1992, his other two casinos, the Castle and Trump Plaza, also filed for bankruptcy. In 1993, his fortunes began to improve because creditors valued his brand name — and his casino licenses. So they started loaning him money again to stay afloat. In 1995, Trump turned his Trump Plaza casino into a publicly traded company, Trump Hotels and Casino Resorts, which he controlled. (That company filed for bankruptcy protection in 2004.) The Wall Street Journal said of his 1995 moves, "He cut a deal with banks that wiped out the last of his personal debt. He paid less than half of the roughly $110 million he owed, according to a person familiar with the matter." That year — 1995 — appears to have been the key turning point for Trump. He wound down his own debt troubles but left many casino workers, contractors and lenders in trouble. By 1996, Fortune was marveling at Trump's "Houdini-like escape from creditors." Exactly how Trump emerged ready to start a fresh round of business dealings is murky. The Wall Street Journal said of Trump's 1995 escape from financial catastrophe: "An attorney for the New Jersey attorney general's office — which had spent years studying Mr. Trump's financial maneuvering — said, 'I'm not certain if there's any one person on our staff that really understood it.' "
Now the New York Times report adds another piece to the puzzle of Trump's comeback story. The publication reported that the documents it published "reveal the extraordinary tax benefits that Mr. Trump, the Republican presidential nominee, derived from the financial wreckage he left behind in the early 1990s ... a $916 million loss in 1995 would have been large enough to wipe out more than $50 million a year in taxable income over 18 years." In other words, Trump's financial salvation appears to have come from a combination of walking away from debts, and then borrowing more to rebuild a real estate empire — and all without the drag of federal income tax bills. On Sunday's Meet the Press, Rudy Giuliani, a Trump campaign surrogate, said the businessman's financial rebound from 1995 shows "he's a genius." Hillary Clinton, Trump's Democratic opponent, released a statement late Saturday saying the Times story confirms "the colossal nature of Donald Trump's past business failures. ... He stiffed small businesses, laid off workers, and walked away from hardworking communities. And how did it work out for him? He apparently got to avoid paying taxes for nearly two decades."